By all accounts, Elsevier’s 2013 acquisition of academic social network Mendeley has helped make us a more technology-oriented, big data company. It’s had a huge impact on the tools we can provide to digitally enhance the performance of scientists and health professionals. Mendeley itself has been able to grow substantially since it joined Elsevier, now serving more than 4m users in 180 countries worldwide. Accommodating Mendeley’s culture and technology has led to many changes at Elsevier, not least of which has been the need for newly designed space to help us recruit and house engineers, data scientists and product managers. Both the manner in which Elsevier serves the research community, and the type of professionals we have to hire have evolved dramatically in recent years. The environment needed to help them flourish has evolved as well. London technology professionals interested in working at either of our new London locations can search for new positions here. The location at the Alphabeta development in Shoreditch is the second office Elsevier has opened in London over the past 18 months. Our new space at London Wall, provided a new home for The Lancet, other publishing teams and a variety of other groups and support staff. 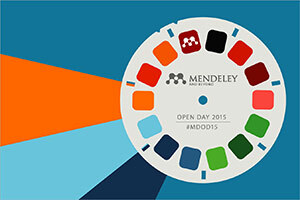 Alphabeta, meanwhile, opened in October and houses Mendeley and Elsevier technology staff. 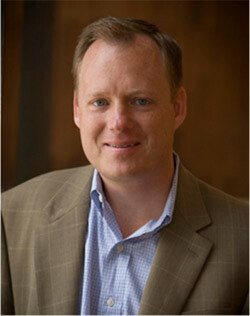 More than 200 people will work there, 150 of which will be filling newly created positions. 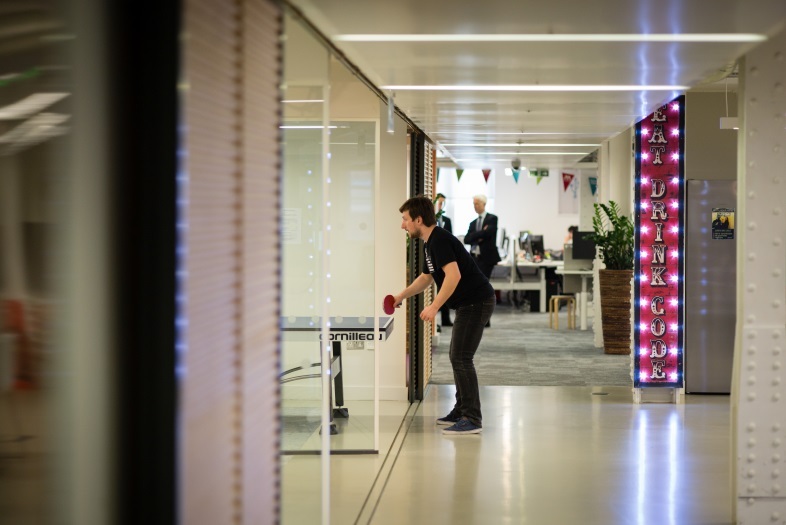 Employees there now work in a building that fuels innovation and collaboration in a fast-paced, fun environment. The building offers access to digital user-testing facilities, a yoga room, a basketball court and a ramp that allows cyclists to ride directly into the building. But while London is already attractive to science-focused businesses, there is more that the government can do to help foster an ecosystem that will help transform London into a science hub. More than anything, it must create an environment in which universities’ discoveries can be translated into commercial products. 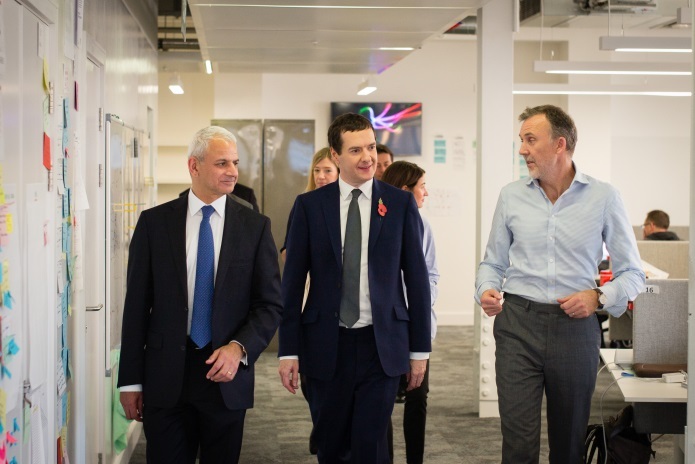 Elsevier’s role in creating a science and technology hub in London is of particular interest to UK Chancellor, Rt Hon George Osborne, who attended the launch of the Alphabeta office. The Chancellor and Ron discussed the importance of London as a science hub, how technology hubs can drive innovation and growth, and how cities in the UK compete on a global stage to attract investment from international companies. The Chancellor said of the new office, “It is particularly exciting that Elsevier’s tech hub is focused on developing new software that will raise the productivity of the UK research base and enable scientists here to make discoveries faster.” Another demonstration of London building upon its science heritage is the Francis Crick Institute, a pioneering medical research facility, currently under construction in the King's Cross area. Elsevier recently announced a £100k pd donation to the Create the Change Campaign, Cancer Research UK's campaign to raise funds to complete the construction. I’m delighted to open Elsevier’s advanced technology hub here in London. The creation of this center of excellence and the 150 new jobs is further evidence that the government’s strategy of backing technology and creating high skilled jobs is delivering. London is beating other global cities in terms of attracting vital investment from companies that can choose where they locate their technology hubs – and RELX Group’s commitment today perfectly illustrates that. It is particularly exciting that Elsevier’s tech hub is focused on developing new software that will raise the productivity of the UK research base and enable scientists here to make discoveries faster. The offices, donations and other activities we undertake in London and elsewhere are all representative of how we are effectively supporting both science and society.